1) Characteristic #1. This Beast rises up out of the sea, indicating that it would arise from among the established nations of the then-known world. Characteristic #2. This Beast has parts of 3 different beasts within it - Leopard, Bear, Lion, revealing that it would have aspects of the kingdoms of Greece, Medo-Persia and Babylon within it. Characteristic #3. This Beast has 10 horns and 10 crowns upon its horns, and this indicated that as the ancient Roman Empire consisted of precisely 10 different regions of power which supported it, so this Beast of Revelation 13 would arise after the Roman Empire had fallen and would also be supported and upheld by these same 10 different regions of now kingly power located in Western Europe. Characteristic #4. The Dragon gives this Beast its power and authority, revealing that Satan is the real power behind the working of this Beast, and the Devil gives it great authority to rule over the world. Characteristic #5. This Beast receives a deadly wound, which becomes healed over time, indicating that as this Beast is a world-ruling power arising after Babylon, Medo-Persia, Greece and Rome had fallen, then for it to receive a deadly wound that would be healed signifies that this Beast power would be conquered and almost cease to exist, only to be revived back to power sometime later. Characteristic #6. This Beast is both a political as well as a religious power. This is because the Bible declares that “all the world wonders after the Beast”, and “all that dwell upon the earth shall worship him”, thereby revealing that this Beast wields immense world-wide political as well as religious power over all mankind! Characteristic #7. This Beast commits blasphemy against God, indicating that this Beast would claim to be worshipping only God, while in actuality it was worshipping false gods; it would also claim to be able to forgive sins; and also claim to be God on earth. Characteristic #8. This Beast makes war with and overcomes the saints, revealing that this Beast will persecute, war against and overcome those who obey God and Jesus Christ through faith and who also keep their commandments. Characteristic #9. This Beasts rules for 42 months, indicating that since each month in Bible prophecy is exactly 30 days, so 42 months would mean that this Beast would rule over the known world for 1260 prophetic days. Also since each prophetic day represents 1 year of literal time, then this Beast is prophesied to rule over the world for 1260 literal years. Characteristic #10. This Beast has the number 666, revealing that since the Bible states that “It is the number of a man," and that it is "the number of his name", so this literal number of 666 is somehow connected with the numeric number of a man’s name who is connected with this Beast. 2) Any world power which manifests all 10 of these identifying characteristics is without a doubt this Beast of Revelation 13 is. To do this involves examining all possible contenders which clearly manifest the first characteristic for this Beast. Then applying each one of the remaining 9 characteristics to each of these contenders, and eliminate all those who fail to perfectly match up. For instance, characteristic #1 reveals that this Beast rises up out of the sea, or from among already populated areas of earth. This could apply to a whole lot of different nations at any time during this earth’s history. But characteristic #3 reveals that this Beast arises from among the nations of Western Europe just after the fall of the Roman Empire, and this truth helps to narrow down the field of contenders to just those during this appropriate time frame. Characteristic #6 reveals that the Beast is both a political as well as a religious power, and this fact alone, when combined with those characteristics above, eliminates nearly every nation or power of Western Europe, except perhaps Brittan and the Roman Catholic Church, which both arose after the fall of Rome and both became political and religious powers in Europe. But characteristic #3 also reveals that this Beast has 10 crowned horns which represented the same 10 different regions of power in Western Europe which empowered the Roman Empire that now have become kingly. Brittan is just one of these kingly regions, not all 10, and thus is eliminated from being the Beast. Applying just these 3 above characteristics eliminates all possible contenders except the Roman Catholic Church! But in order for the Roman Catholic Church to be this Beast, she must manifest all 10 characteristics and not just 3! 3) Characteristic #1. This Beast rises up out of the sea, indicating that it would arise from among the established nations of the then-known world. Did the Roman Catholic Church arise from among established nations? It is clearly a recognized historical fact that the Roman Catholic Church arose among established nations of what became Western Europe - becoming established in Rome, which was a city located within the territory of the nation which later became known as Italy! Just before the turn of the 2nd century AD, we find that there was an official Church at Rome which was headed by a Bishop, and this church was recognized and established as a center for Christians in the West, as compared to those located in the East. “88-97[AD]: Pontificate of St. Clement I,...as bishop of Rome, one of the Apostolic Fathers. The First Epistle of Clement to the Corinthians, with which he has been identified, was addressed by the Church of Rome to the Church at Corinth, the scene of irregularities and divisions in the Christian community.” Church History, by Our Catholic Faith (http://www.ourcatholicfaith.org/churchhistory.html, accessed 7-28-16). “By the end of the [first] century, Antioch, Alexandria and Ephesus in the East and Rome in the West were established centers of Christian population and influence.” Church History, by Our Catholic Faith (http://www.ourcatholicfaith.org/churchhistory.html, accessed 7-28-16). Just after the 2nd century had begun, this Church of Rome began to be called “Catholic”! “c. 107 [AD]: St. Ignatius of Antioch was martyred at Rome. He was the first writer to use the expression, ‘the Catholic Church.’” Church History, by Our Catholic Faith (http://www.ourcatholicfaith.org/churchhistory.html, accessed 7-28-16). Even though this Catholic Church at Rome did not rise to any significant power until after the fall of the Roman Empire, yet we can clearly see it becoming established from within the territory of Rome itself. So the Roman Catholic Church does indeed manifest this 1st characteristic of the Beast of Revelation 13. 4) Characteristic #2. This Beast has parts of 3 different beasts within it - Leopard, Bear, Lion, revealing that it would have aspects of the kingdoms of Greece, Medo-Persia and Babylon within it. Did the Roman Catholic Church also have aspects of the kingdoms of Greece, Medo-Persia and Babylon within it? Few people realize how completely the pagan philosophy of Greece captured the world, and it also played a significant role in the formation of thought in the church. Several Greek philosophers are famous for the impact they had on human thought. During the middle ages, when the Bible was outlawed, men looked to Plato, Aristotle, and Socrates for light. Their paganistic philosophy greatly permeated religious thinking, helping to shape many of the concepts that became a part of Christian belief, but for which there was no Biblical support. For instance; Plato believed in the immortality of the soul. In his understanding, when heroes and notable persons died they went immediately to mansions and places of reward, while the common people went down to the infernal regions to receive punishment for sinful pollutions until they had been cleansed. Here we see the Catholic belief of the elevation of the saints to heaven at death, and also the doctrine of purgatory. Plato also believed in the concept of separating the body from the soul. He believed this was achieved by afflicting the body, by depravation, and by separation from society. Thus was laid the groundwork for the later emergence of the Catholic belief for monasticism and penances. So aspects of this first Beast – the Leopard or Greece – are indeed within the Roman Catholic Church. The Medes and Persians had a method of government peculiarly their own. “Then these presidents and princes assembled together to the king, and said thus unto him, King Darius, live for ever. All the presidents of the kingdom, the governors, and the princes, the counsellors, and the captains, have consulted together to establish a royal statute, and to make a firm decree, that whosoever shall ask a petition of any God or man for thirty days, save of thee, O king, he shall be cast into the den of lions. Now, O king, establish the decree, and sign the writing, that it be not changed, according to the law of the Medes and Persians, which altereth not. Wherefore king Darius signed the writing and the decree. Now when Daniel knew that the writing was signed, he went into his house; and his windows being open in his chamber toward Jerusalem, he kneeled upon his knees three times a day, and prayed, and gave thanks before his God, as he did aforetime. Then these men assembled, and found Daniel praying and making supplication before his God. Then they came near, and spake before the king concerning the king's decree; Hast thou not signed a decree, that every man that shall ask a petition of any God or man within thirty days, save of thee, O king, shall be cast into the den of lions? The king answered and said, The thing is true, according to the law of the Medes and Persians, which altereth not. Then answered they and said before the king, That Daniel, which is of the children of the captivity of Judah, regardeth not thee, O king, nor the decree that thou hast signed, but maketh his petition three times a day. Then the king, when he heard these words, was sore displeased with himself, and set his heart on Daniel to deliver him: and he laboured till the going down of the sun to deliver him. Then these men assembled unto the king, and said unto the king, Know, O king, that the law of the Medes and Persians is, That no decree nor statute which the king establisheth may be changed. Then the king commanded, and they brought Daniel, and cast him into the den of lions. Now the king spake and said unto Daniel, Thy God whom thou servest continually, he will deliver thee. And a stone was brought, and laid upon the mouth of the den; and the king sealed it with his own signet, and with the signet of his lords; that the purpose might not be changed concerning Daniel.” Daniel 6:6-17. In these verses we see that when the king of the Medes and Persians spoke law, he was considered to be infallible. Once given, it was not possible to change the law. This finds its counterpart in the doctrine of the infallibility of the Pope when he speaks ex-cathedra, and defines points of law or doctrine. So aspects of this second Beast – the Bear or Medo-Persia are indeed within the Roman Catholic Church. Ancient Babylon was the kingdom founded by Nimrod after the flood. Nimrod chose to fight against the Lord God of heaven, and thus the kingdom he founded had nothing to do with God’s truth, but had all to do with Satan’s errors. Babylon became the origin and source for all paganistic beliefs. The fundamental difference between the religion of the Bible and the Babylonian religion of Satan, is the teaching regarding God our Creator and how people can approach and speak to Him. The Bible declares that God the Father spoke all created things into existence through the Lord God Michael (who became Jesus Christ when born into humanity), and God the Holy Spirit then carried out this creation command (Ephesians 3:9; Hebrews 1:10;Isaiah 40:13-14; Job 26:13). This showed there to be 3 different Gods who unitedly worked together to bring forth all of creation, and that God the Father is supreme in authority. In order for people to come to God the Father with their needs is only through the One Mediator between God and mankind which is the Lord God Jesus Christ as He alone is both God and human (1 Timothy 2:5). Since we cannot directly see Jesus or the Father, then coming directly to God is done through faith and belief. Therefore we ourselves through faith can know that we directly come to God our Father through our Lord God Jesus Christ and can personally ask Him for help or blessings at any time of need. But Babylonian paganism teaches just the opposite of these Bible truths. The mystery religion of Babylon taught that there was only One supreme god who was invisible and hidden. This One Supreme god then began creation, not by speaking it into existence, but by first dividing his divine essence into 3 deities, and from this trinity everything else was created. This meant that this combined trinity made up the manifestation of this One Supreme hidden and invisible god, and all that they afterwards created, including lessor deities and their lessor deities, etc., were all divisions of their divine essence and ultimately part of the essence of this One supreme god. So all the universe of starry suns, constellations, planets, including this earth and all nature within it – including mankind, contained part of the essence of the One supreme god, even though they may have been created by any one of the multitude of lessor deities. But all of creation, both animate and inanimate, ultimately led back to the original trinity and to the One supreme god. Since this One Supreme god was hidden and invisible then the people could never hope to directly come into the presence of this One god themselves with their needs and petitions. Also the trinity and all lessor deities, in an ever decreasing chain of command, were unapproachable as well, except through intermediaries that they favored. These intermediaries were devoted priests or priestesses usually found located in the particular temple devoted to the worship of the particular deity which the people needed help from. So even though the people could not themselves bring their needs directly to their god, yet they could bring these needs to any one of the number of the human intermediaries at the appropriate Temple who might then be able to bring their needs to the attention of their chosen god and gain his or her help. Therefore the faith and belief of the people were place in these human beings, and in what they could do for them to obtain the favor of god. 7) Are aspects of the pagan mystery religion of Babylon found to be part of the Roman Catholic Church? "The [Catholic] Church did everything it could to stamp out such 'pagan' rites, but had to capitulate and allow the rites to continue with only the name of the local deity changed to some Christian saint's name." Religious Tradition and Myth, p 56-57, by Dr. Erwin Ramsdell Goodenough, Professor of Religion, Harvard University, Published by Yale University Press, 1937. "The use of temples, and these dedicated to particular saints, and ornamented on occasions with branches of trees; incense, lamps, and candles; votive offerings on recovery from illness; holy water; asylums; holydays and seasons, use of calendars, processions, blessings on the fields; sacerdotal vestments, the tonsure, the ring in marriage, turning to the East, images at a later date, perhaps the ecclesiastical chant, and the Kyrie Eleison, are all of pagan origin, and sanctified by their adoption into the Church." An Essay On the Development of Christian Doctrine, p 371-372, by John Henry “Cardinal” Newman. p 371-372, Publisher: Longmans, Green and Co, London, 1887 (https://archive.org/stream/essayonthedevelo025069mbp/essayonthedevelo025069mbp_djvu.txt, accessed 7-29-16). “It has often been charged…that Catholicism is overlaid with many pagan incrustations. Catholicism is ready to accept that accusation – and even to make it her boast.” The story of American Catholicism, Volume 1, p 48, by Theodore Maynard, published by Doubleday, 1960. "It is interesting to note how often our Church has availed herself of practices which were in common use among pagans...Thus it is true, in a certain sense, that some Catholic rites and ceremonies are a reproduction of those of pagan creeds." The Externals of the Catholic Church, Her Government, Ceremonies, Festivals, Sacramentals and Devotions, p 156, by John F. Sullivan, published by P.J. Kennedy, NY, 1942. 1. Trinity - One Supreme god divided into 3. Trinity - Father, Son and Holy Spirit making up One god. 2. People must go to priest to reach god. People must go to priest to reach god. 3. Celebacy of priests and priestesses. Celebacy of priests and nuns. 4. The nativity of the Sun, and the birth of Tammuz December 25. The nativity of Jesus on Christmas December 25. 5. The assumption of Semiramus who became the mother goddess. The assumption of Mary, who became the mother of God. 6. The mother goddess was worshiped as the Queen of Heaven. The Virgin Mary worshiped as the Queen of Heaven. 7. Cakes decorated to the goddess with a "+" drawn on it. 8. 40 days fasting for Tammuz. 10. 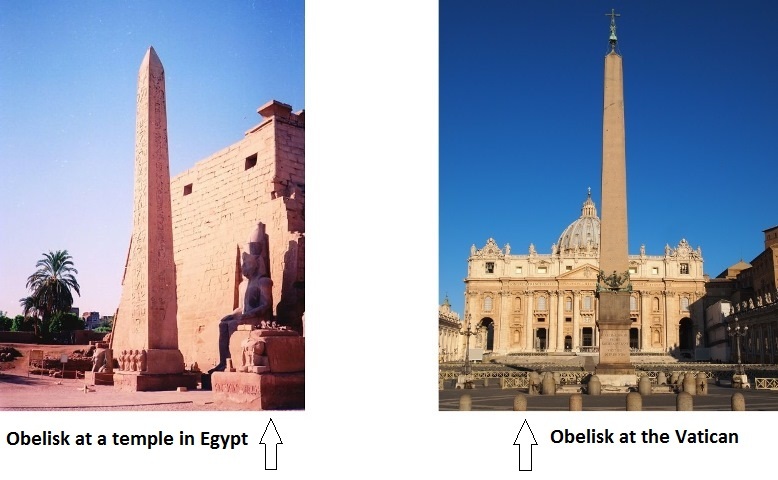 Veneration of graven images of different greater and lesser gods in the heavens. Veneration of graven images of Jesus, Mary, Peter, and of "lesser" saints in the heavens. 11. The belief of immortality of the soul and burning place of torment. The belief of immortality of the soul and burning place of torment. 12. The doctrine of purgatory. 13. The belief of the dead visiting the living, feast held for all in November. The festival of All Saints Day held November 1, and All Souls Day held November 2. 14. Burning incense and candles. The burning of incense and candles. 16. Chants and repetitive prayers. 17. 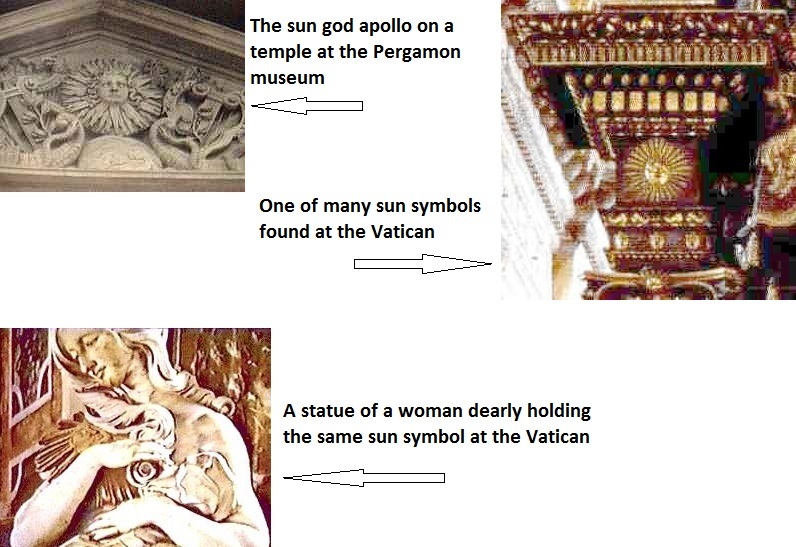 Symbol of the cross as a symbol of Sun worship. 18. Amulets and idols to scare away evil spirits. The wearing of crucifixes and medals displayed for protection, such as the Scapular. 19 The round disk "sun" wafer IHS symbol of Isis, Horus & Seb, eaten as food for the soul. Some wafers also had a large "+" sign engraved on them as well. The wafer used in the Eucharist is round with IHS engraved on it on one side, and many have a large "+" engraved on the other side. Paintings of the child (Jesus) and mother (Mary) with halos or of the Sun around their heads. 21. Infant baptism, and sprinkling of holy water. Infant baptism, and sprinkling of holy water. 22. The title Pontifex Maximus used for chief head of the Babylonian mystery religion. Pontifex Maximus used as one of the first names for the office of Pope. 23. The high priest kings carried on a throne to the to the Temple of his god. The Pope carried on a portable throne to the Basilica of St. Peter (Sedia Gestoria). 24. The Pagan high priest king believed to be the incarnate of the Sun god. The Pope proclaims to be Christ's Vicar (replacement) here on Earth. The pope also claims to be god on earth. 25. 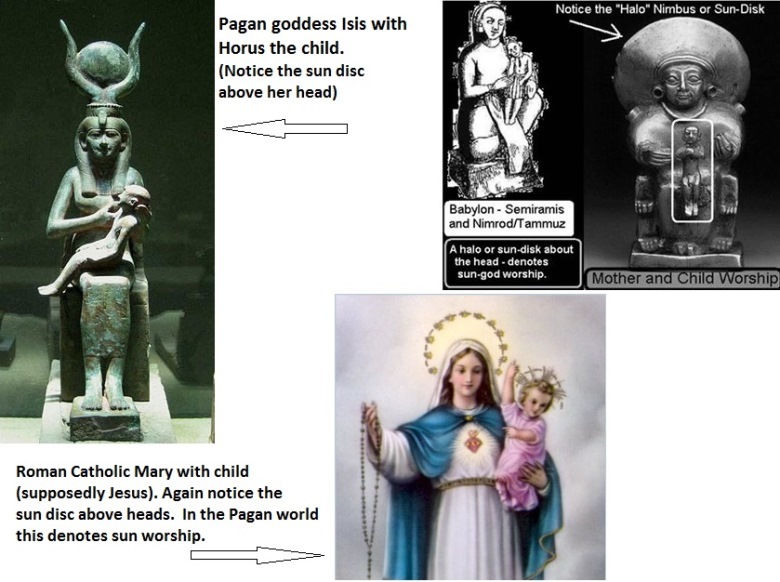 Statues of a "Madonna" found in all Pagan cults (i.e., Egyptian Madonna Isis with her son Horus; Hindu cults with Divaki and her son Krishna). Statues of Mary can be found in all Catholic churches holding baby Jesus. 26. 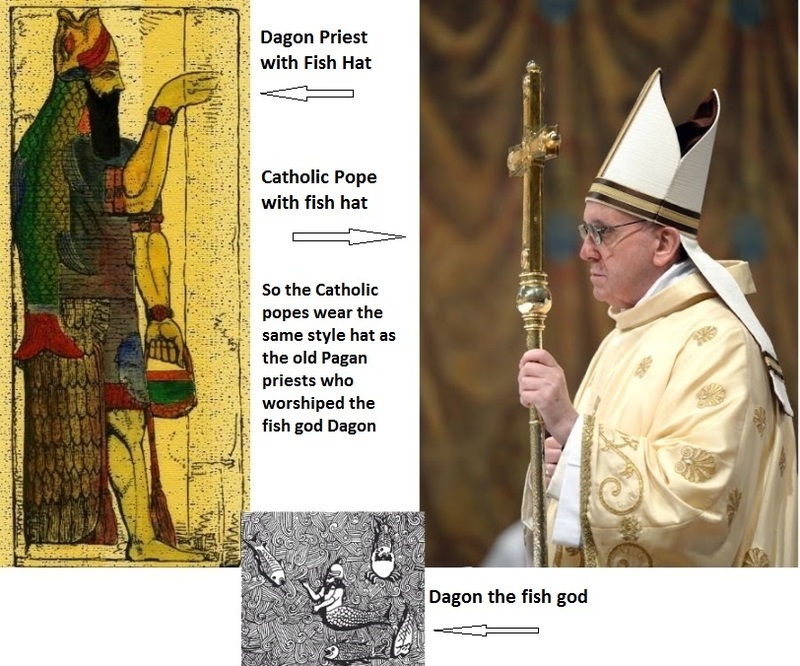 Oanne (known as Dagon by others), Babylonian fish-god (half man half fish) was depicted by Pagan high priests wearing a fish head mitre or head dress on their head to symbolize man and fish joining when the "sun god" set into the ocean. Fish-like Mitres are worn by all Popes. So aspects of this third Beast – the Lion or Babylon are very much seen to be within the Roman Catholic Church, and so much so that it is like this mystery religion of Babylon is still alive and well today! Since the Roman Catholic Church has aspects of Greece, Persia and Babylon within it, then this means that the Roman Catholic Church does indeed manifest this 2nd characteristic of the Beast of Revelation 13.